Our readers nominated their favorite subscription boxes, then voted on which of those boxes they loved most. Here’s what they chose as the Best Boxes That Give Back! These subscription boxes aren’t just fun ways to treat yourself—these brands also give back to their communities! Whether they donate towards worthy causes or support artisans through their ethical practices, these subscription boxes go beyond delivering great value and unique products to your doorstep. To be eligible for voting in this category, we had to find some information on their charitable programs on their websites, which we’re summarizing for you here. The Products: Be more intentional with your shopping with help from CAUSEBOX! Each box contains at least $150 worth of products including cosmetics, home decor items, gifts, accessories, jewelry, and other self-care treats, all sourced from socially-conscious companies. Check out all our CAUSEBOX reviews to learn more. How they give back: Didn’t know this uber-popular subscription had a charitable angle, did you? They’re humble about it, but each season, they give back to a different organization. Think great causes like UNICEF, the American Heart Association, Pencils of Promise, The Starlight Foundation, and Girl Rising. Show your support while treating yourself to FabFitFun‘s quarterly assortment of must-have beauty goodies, cute accessories, and fun wellness items! 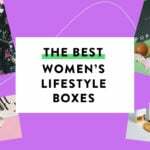 Check out all of our FabFitFun Box reviews to learn more. The Cost: Subscriptions start at $32.99 per month + shipping. Sign up here! How they give back: The Bookworm Box believes in “good deeds, great reads.” This romance novel subscription founded by Colleen Hoover donates 100% of its profits to charities around the world, including clean water groups, disaster relief organizations, and more. Apart from the good vibes, you’ll get at least one autographed book per month plus other bookish goodies! Check out all of our Bookworm Box reviews to learn more. How they give back: BarkBox not only creates the coolest, quirkiest, dog-approved toys, treats, and grooming products around—they also partner with rescues, shelters, and nonprofit organizations to help dogs in need! Check out all of our BarkBox reviews to learn more. How they give back: All of the gorgeous home, kitchen, food, style and other products inside GlobeIn’s monthly boxes are fair trade, meaning they’re sourced in a way that directly benefits the artisans who created them. In addition to the unique, high-quality items themselves, you’ll also get a booklet that tells the stories of the people, communities, and companies behind each gift! Check out our GlobeIn reviews to learn more. The Cost: $0.00 and up. 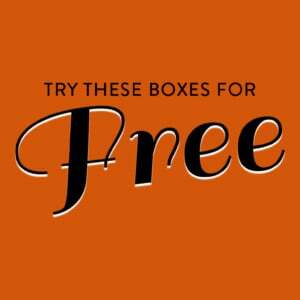 Your box is sent to you free, including styling, shipping, and returns. Keep and pay for what you like and mail back any unworn items you don’t want within 7 days. Per kidpik, the average cost is $12-13 per item including a 30% discount if you keep the entire box. Sign up here! COUPON: Save $15 off your first purchase of $40! No coupon required—just use this link! How they give back: This styling service lets you keep the girls mix-and-match clothing and accessories you want and return what you don’t. But they also give you the option to purchase and donate the pieces you decide not to keep for your child (ages 4-16)! What an awesome way to teach your child about the spirit of giving (and get the 30% off discount when you buy the full box). Check out our kidpik reviews to learn more. The Cost: $19.99 a month + free shipping (or save with longer commitments). Sign up here! How they give back: Part of the proceeds from each of this subscription’s boxes of decor, stationery, home goods, and other inspiring Christian gifts goes towards Union Rescue Mission, which helps combat homelessness in Los Angeles and beyond! Check out our Loved + Blessed reviews to learn more. The Cost: $34.00 per month. Sign up here! How they give back: The gorgeous jewelry, decor items, and other accessories inside each monthly box are handmade by people in vulnerable situations—refugees, victims of human trafficking, and beyond. The box aims to support and bring hope to these artisans, their families, and their communities. How they give back: With each box of high-quality treats and toys catered specifically to your dog’s size, RescueBox donates to shelters and organizations that provide vaccines and care for dogs in need across the country. Check out our RescueBox reviews to learn more. The Cost: $0.00 to order a box, and pay only for the clothes you keep! The cost of an entire kids box is $98 ($14-$16 per item) and an entire baby box is $68.00 ($12-$13 per item). Sign up here! How they give back: Kidbox curates seasonal collections of mix-and-match children’s clothing just for your child. If you choose to keep everything you got in your box, Kidbox donates clothes to a child in need. The best part? You and your kiddo can sit down to decide what cause you’d like your donation to go towards, including low-income or homeless families, victims of natural disasters, and military families. Check out our KidBox reviews to learn more. The Cost: $9.99 a month for the Tasting box, $19.95 a month for the Deluxe box, and $24.99 a month for the Gluten-Free box. Save with longer subscriptions. Free US shipping. $3.99 International shipping. Sign up here! COUPON: Get 40% off your first box! No coupon required—just use this link! How they give back: Love with Food introduces you to a monthly assortment of delicious snacks that are organic, natural, and/or free from artificial ingredients. Additionally, they donate to a food bank for every purchase made! Check out our Love with Food reviews to learn more. The Cost: The Uno box (4-5 items) starts at $29.00 per box, and the Grande box (5-7 items per month) starts at $39.00 per box. The cost may increase depending on your preferences. How they give back: This subscription box is filled with toys, treats, and accessories customized for your pet’s needs and preferences. $2.00 from your box purchase goes towards helping 3,700 rescue organizations host adoption events, spay/neuter programs, microchipping programs, and foster care programs for animals in need! Check out our Pupjoy reviews to learn more. The Cost: Choose from 3 subscription levels: Chakra (2 items for $45.00 per month), Karma (2 premium items for $69.00 per month), or Guru (3 premium items for $79.00 per month). Cancel anytime. Exchanges are easy, and you can always change your preferences via your online account. How they give back: In addition to delivering cute, high-quality yoga and fitness apparel to your door, YogaClub also donates a yoga class to a child in need for every box purchased! Check out our YogaClub reviews to learn more. Ships to: US and Canada. Shipping is $4.95 for all USA orders and $9.95 for Alaska, Hawaii and Canada orders. 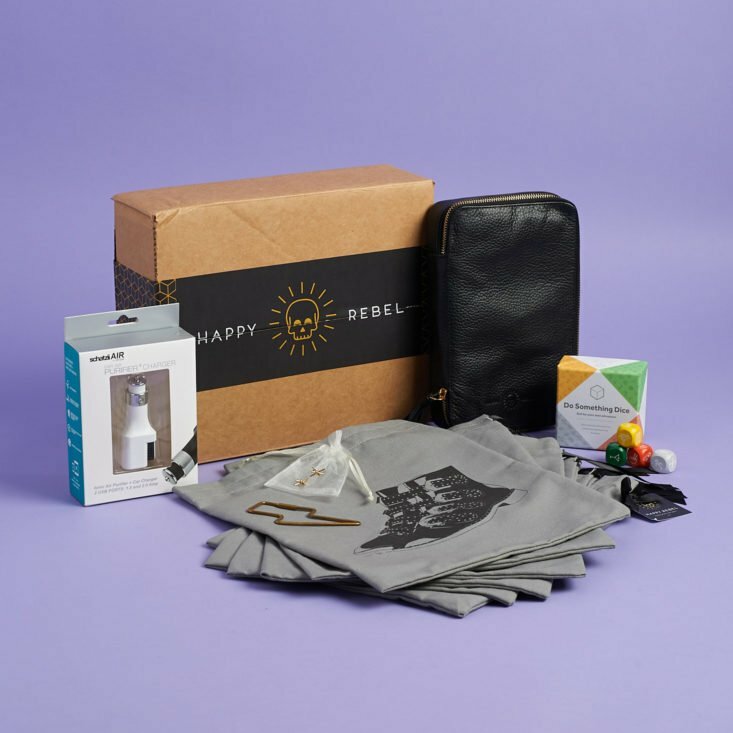 How they give back: Each Happy Rebel box contains 4-6 items, such as jewelry, fashion accessories, home decor, beauty products, as well as other various modern, edgy lifestyle items. They donate a percentage of each season’s profits to a different charity that’s helping women and children around the globe. Each box includes information about that season’s charity, so you can learn about the good your purchase is doing in the world! Check out our Happy Rebel Box reviews to learn more. The Cost: Kids subscriptions are $13.99/month for two pairs with free shipping. Adult subscriptions are $11.99 + free shipping a month for one pair, $20 + free shipping a month for two pairs, or $27 + free shipping a month for three pairs, with discounts and extra socks for longer subscription commitments. Sign up here! How they give back: You’re not the only one who’ll get to enjoy these cute socks! This subscription box partners with Lava Mae, an organization that brings hygiene and other services to the homeless, including clean, warm, comforting socks! Check out our Say It With A Sock reviews to learn more. The Cost: $12.99 per month + free shipping. Sign up now! How they give back: Each pair elegant earrings you receive from this subscription box are fair trade, meaning 100% of the proceeds support the women artisans who handcrafted the jewelry. Check out our Fair Trade Friday Earring of the Month reviews to learn more. The Cost: $29.95/month + free US shipping (or save with longer commitments). Sign up here! How they give back: Benevolent Beauty sends out strictly cruelty-free items in the categories of cosmetics, hair care, skin care, and beauty tools. (The Monthly VIP box contains 4-7 full-size items each month, and the Monthly Mini box contains 2-3 full-size items each month.) They also donate a portion of their proceeds to organizations that fight animal testing and cruelty! Check out our Benevolent Beauty Box reviews to learn more. The Cost: $34.95 a month + shipping. Bi-monthly, quarterly and annual subscriptions are available too. The quarterly Jewelry box is $49.95 a quarter and the Essential Oil box is $15.95 a month. Sign up here! How they give back: The items in this monthly subscription box are meant to enhance your yoga practice and spiritual lifestyle. They also believe in enhancing community, so BuddhiBox donates proceeds from each month’s sales to a different charity! Check out our BuddhiBox reviews to learn more. The Cost: $29.95 a box (Or $47.95 for the VIP subscription which includes an additional full-size beauty product with a value over $35). Sign up here! How they give back: Treating yourself to the cruelty-free, toxin-free beauty, home, lifestyle, snack, and other wellness products in this vegan subscription help Love Goodly donate to a new organization every month. Past organizations have included PETA, Farm Sanctuary, and Cure Cervical Cancer. Check out our Love Goodly reviews to learn more. The Cost: Subscriptions start at $16.00 per shipment. Sign up here! How they give back: Kali’s chemical-free, organic feminine hygiene products, including organic menstrual pads and 100% cotton tampons, are a popular pick. (We love their rose gold packaging, too!) Kali believes in helping girls and women all over the world have healthy, comfortable periods, so they donate to homeless shelters and are partners of the United Nations Foundation’s Girl Up initiative. Check out our Kali reviews to learn more. That wraps up our list of best subscription boxes that give back! Did your favorite charitable box make the list?